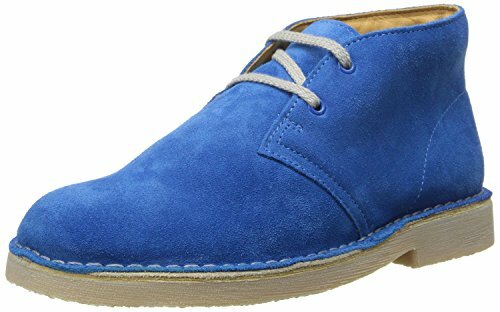 Clarks Originals Kids Cobalt Desert Boot Baby Prewalker 7.5 Wide US by CLARKS at Blood of The Young. MPN: 26104386-428. Hurry! Limited time offer. Offer valid only while supplies last. Remodeled for little boys' feet, these iconic Desert Boots feature the same attention to detail and great looks, with extra growing room built in. Remodeled for little boys' feet, these iconic Desert Boots feature the same attention to detail and great looks, with extra growing room built in. Premium tan suede is teamed with color pop cobalt laces and a hardwearing textured rubber sole - a clever re-interpretation of the familiar crepe. Leather linings enhance the luxe feel. Available in whole and half sizes. Manufacturer: The Clarks Companies, N.A. Publisher: The Clarks Companies, N.A. Studio: The Clarks Companies, N.A.